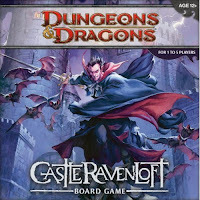 Last night I played a game of Castle Ravenloft from Wizards of the Coast. This game is in the same genre as FFG's Descent. In the game you go on various quests to complete certain goals, it's not just a standard dungeon crawl. It's got good production values comparable to Descent. It's also a simpler and shorter game compared to Descent. But unlike Descent, Castle Ravenloft is entirely a cooperative game. Overall, I prefer Descent mainly because the amount of options and flexibility is superior to Castle Ravenloft. The game does have at least out expansion coming out for it so far (might already be out).